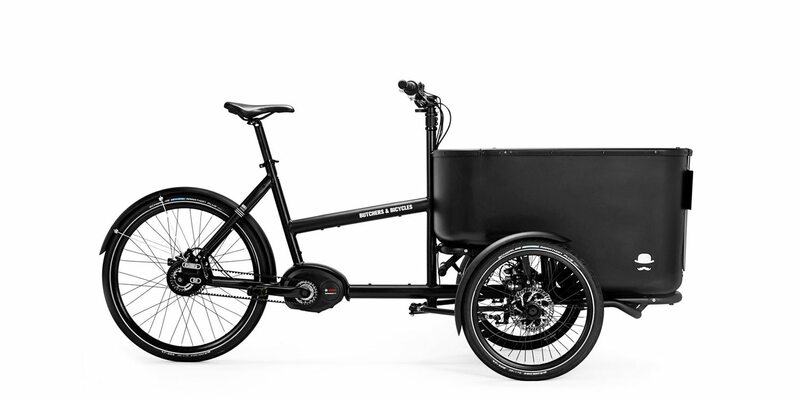 The MK1-E is an electric version of the MK1 from Butchers and Bicycles, a company located in the meatpacking district of Copenhagen. Copenhagen is the capital city of Denmark, a bicycle friendly country in Europe where cycling accounts for roughly 20% of all commuter trips! I was impressed with the look of this thing from the very start and found that the ride is thrilling and dynamic given the tadpole trike three-wheel design. 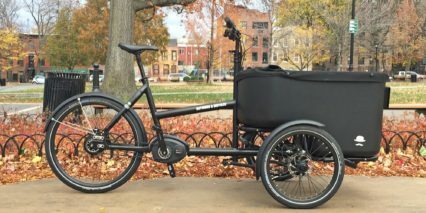 Butchers & Bicycles emphasizes their “Built to Tilt” handling which strives to maintain the fun of a two-wheel bicycle with the utility and strength of a trike. In my opinion, they did an excellent job engineering a leaning experience that is still strong capable as a hauler. 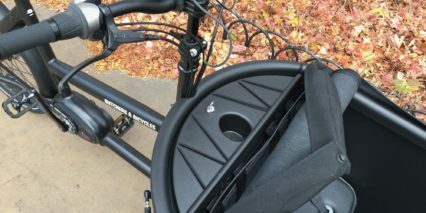 The front wheels are 20″ which tend to be sturdier than more traditional 26″ wheels and allow the cargo box to be lower. This keeps the center of gravity down, high-stacked cargo out of your line of sight and makes it easier for children or dogs to jump in. I love that they offer a clear plastic door option with a child-resistant latch so kiddos can also enjoy the view as well and found that the side opening design didn’t rattle a whole lot. 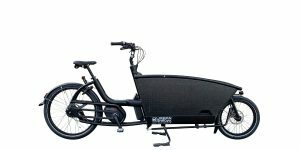 Same deal with the fenders and other accessories, it’s a quiet ebike even though it’s large and fully accessorized. The only real complaint I have about the MK1-E is that it costs a lot. You start at ~$6k USD and go up from there with integrated lighting options, a canvas cover for the front bucket, a clear rain cover that works in tandem with a child-pack (bench seat and two three-point safety belts), a rear facing infant seat and even different drivetrains. Stock, the bike offers a fairly traditional 11-speed cogset with SRAM derailleur but the demo bike I tested at Propel Bikes in New York was upgraded to a NuVinci N360 continuously variable transmission with Gates Carbon belt drive. This drivetrain is quiet, clean, more durable and permits shifting at standstill. That’s a great feature when you’re hauling a heavy load and dealing with hills. For those who want to completely do away with shifting, you can upgrade further to the NuVinci Harmony electronic auto-shifter which lets you choose a pedal cadence then handles all of the shifting automatically. This is a car-replacement electric bike and one that can be ridden faster thanks to the leaning design. Even at the 20 mph top speed, it feels comfortable thanks to a spring suspension system on both of the front swing arms and an upgraded Selle Royal saddle. 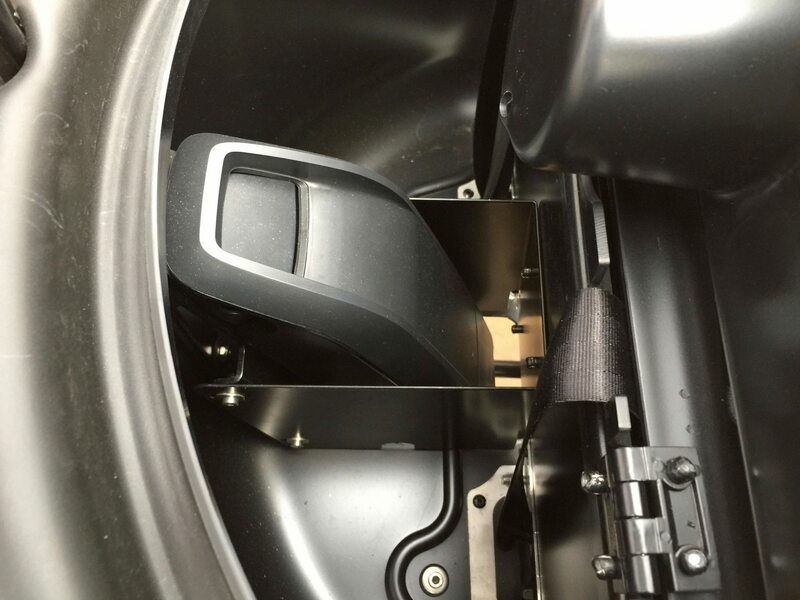 You can take this further by adding your own suspension seat post as was done on the demo bike… just keep in mind that this option can raise the saddle’s minimum height. One of the nicer upgrades here that come standard are Schwalbe tires with a high level of puncture protection and reflective sidewalls. There are two color options and I’m a fan of the white which might show up better when riding in dark environments, complementing the standard reflectors, tires and optional Supernova lights that point where you steer. 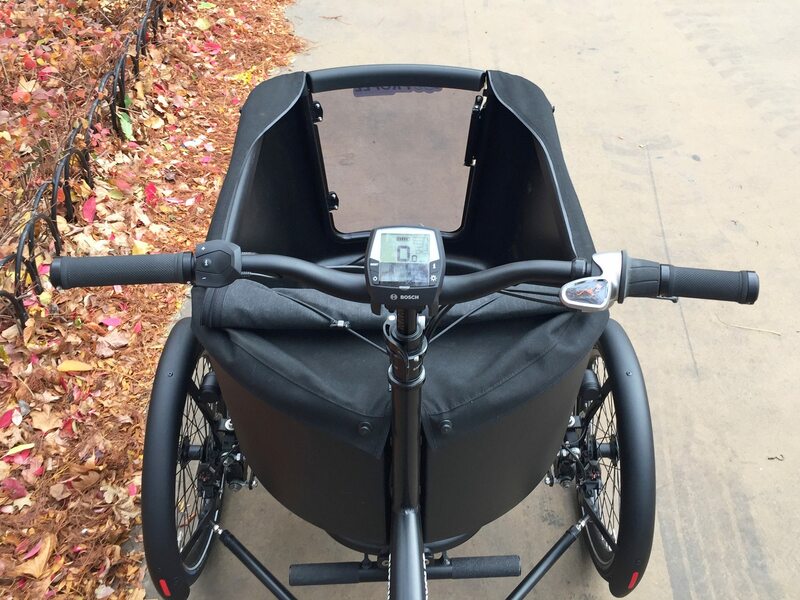 Driving this electric cargo bike is one of my favorite motor systems, it’s a mid-motor that measures your wheel speed, pedal cadence and pedal pressure 1,000 times per second to be as responsive as possible. When you’re hauling gear, especially kids, you want a system that’s going to be reliable but also strong so you don’t get distracted or worn out. 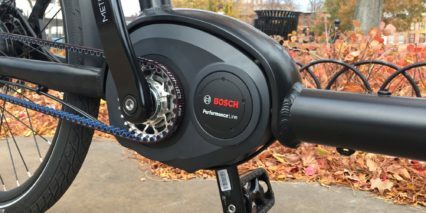 The Bosch Performance Line motor is an excellent choice for this and I had no problem carting my friend Chris around before we started filming the review. He later took me around on the bike and while I’m a bit lighter than his 200 lbs, the bike worked fine for both of us. I’d say, the most difficult part about the bike is not pedaling but getting used to riding a trike more like a traditional two-wheeled bicycle. 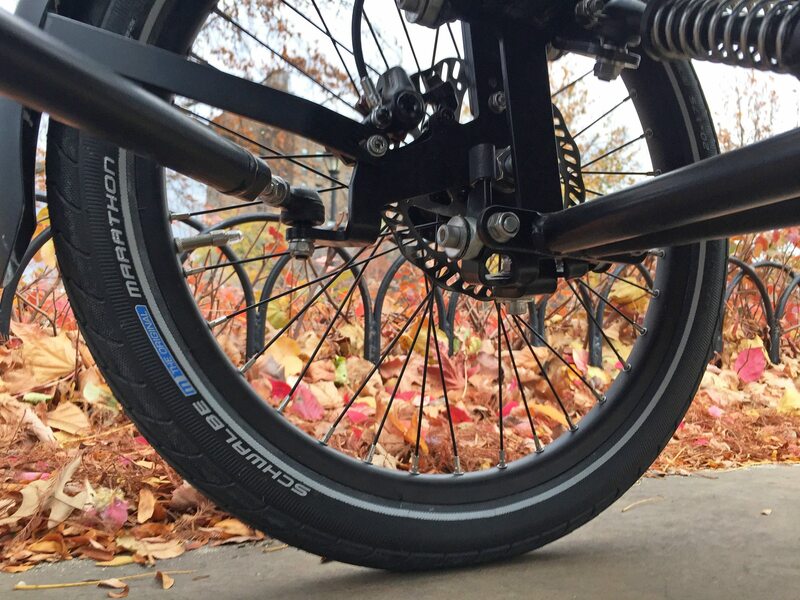 It’s an experience that changes the way other trikes feel after you’ve tried it because you don’t have to slow down so much when turning or turn as hard. I’d say it’s safer because you don’t end up on two wheels when riding at higher speeds on unaven terrain while steering. Anyway, the motor is balance out by three 160 mm hydraulic disc brakes. 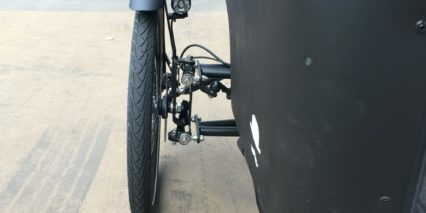 The two front brakes are powered by a single lever (on the left) with a splitter and the rear by the second lever (on the right). The worked very well for me even with the extra weight of a grown man in the front. When it’s time to stop, the left brake lever has a little switch built in that locks front brakes and keeps the bike from rolling away. To fully stabilize the platform however, it’s best to deploy the kickstand system which has a leverage bar you step on and lifts the front of the bike up onto two metal posts with rubber caps. This completely eliminates the side to side tilting of the bike and allows for steady loading. When it’s time to go, just push the bike forward and the stand stows automatically. The cargo bay drops back onto the wheels and the suspension system cushions the load. Brilliant. 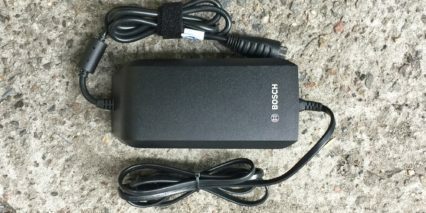 Powering the bike is a standard Bosch Powerpack 400, at least on the bike I tested. The interface for the battery is forward compatible to the newer 500 watt hour pack if you want increased range, but it will cost more. 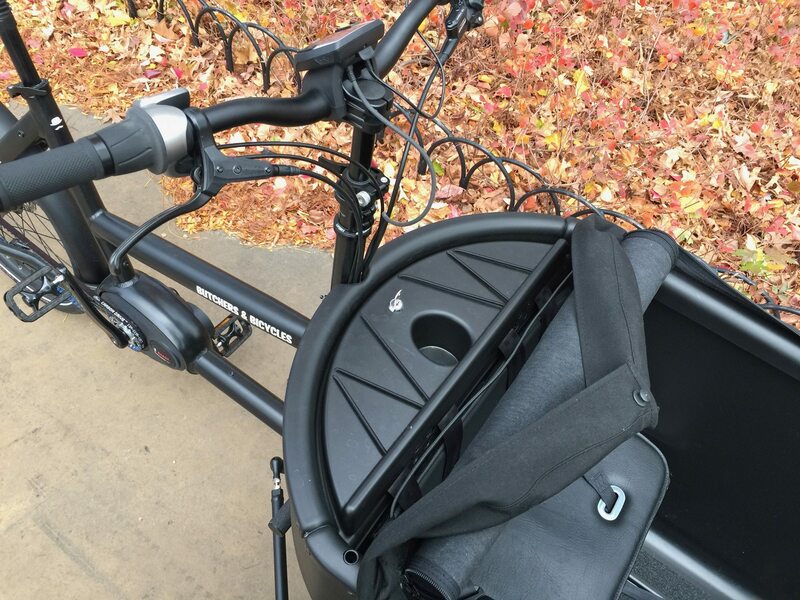 The way it’s setup, with a 115+ lb bike frame, the rider and cargo, I’m guessing the max range with minimal assist would be 50+ miles and if you use the full power of the motor and are climbing a lot you might get 30+ miles per charge. Bosch batteries are compact and have a nice plastic loop on the top making them easier to lift and carry around…. which is important in this case because it’s not exactly easy to charge on the bike. You have to reach up from the bottom and peer into a dark space while trying to plug the charging cable in. 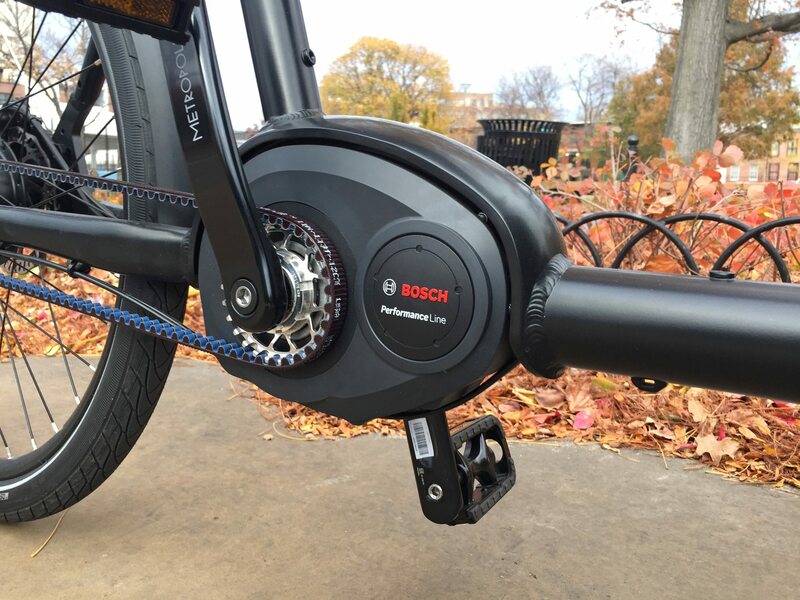 Of all the Bosch powered electric bikes I have tested and reviewed to date, the battery is most hidden and secured here but also the most difficult and time consuming to charge on-bike and and remove, there are just more steps and fiddling involved. I appreciat that the Powerpack battery case has an integrated LED readout to communicate charge level even when it’s not mounted to the bike. For someone who doesn’t ride often but wants to maintain their pack (by not letting it completely discharge) this is a handy feature. Operating the Butchers & Bicycles MK1-E is fairly straight forward once the battery is charged and mounted. Just press the power button on the Intuvia display panel and watch it flicker to life. It starts up quickly and is large enough to read without bending over. You get a little battery infographic with five ticks, a speed readout and an assist level bar on the right. You can arrow up or down using the remote button pad positioned near the left grip to add or reduce power and there’s a little “i” button in between that circulates through trip stats like max speed, odometer and range. Range is very cool because it estimates how far you can go with the remaining battery charge based on how you’ve been riding over the past five miles and the assist level currently chosen. This is way more useful than the basic battery readout (which I wish was a percentage or had more ticks). The “i” button is duplicated on the right portion of the display just above the light button which activates the optional Supernova lights. It’s neat to be able to operate everything from one central location without having to reach too far or flick multiple switches AND I love that the display panel has a built-in Micro-USB port for maintaining the charge in your phone, music player or additional lights. 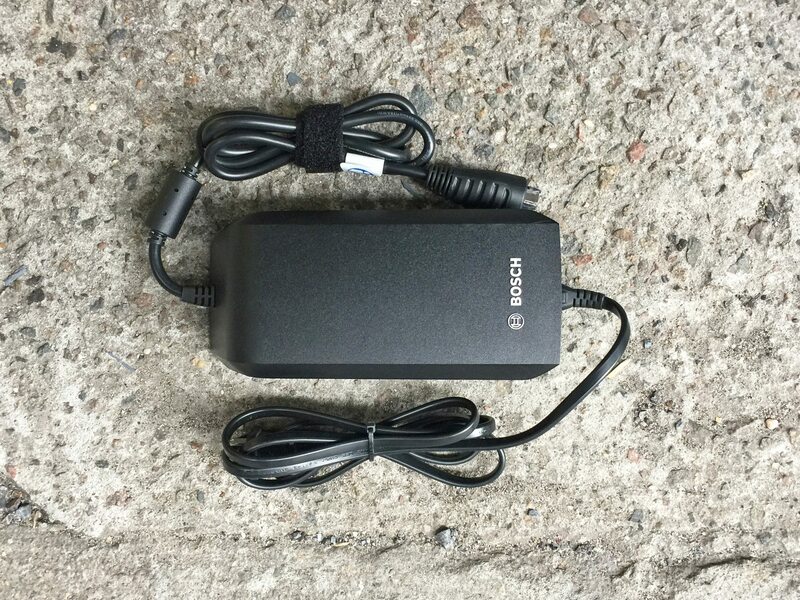 Basically, any portable electronic device you want to add to the bike that can be connected through a Micro-USB cable (which you have to buy separately) you can get a 5 Volt charge for here. 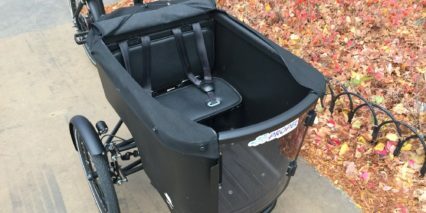 I’ve seen some ebikes with holiday lights strung across the frame and as Chris said, you could mount a sign for your business in the mid section of the frame or on the side of the front bucket and maybe illuminate it this way. My final props to this display are that it can swivel forward and back to reduce glare and that it’s removable! Being able to stop tampering and care for the display is really nice. 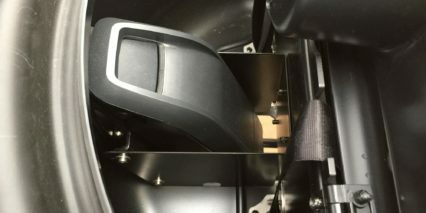 For those who want to leave it on at all times, there is an included set screw that goes into the base of the mount also. 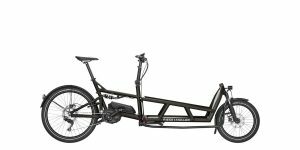 This review has been overwhelmingly positive because I can tell that the MK1 and MK1-E were designed well, use quality parts and offer a unique experience that other front-load cargo trikes just don’t. It does take some getting used to but it’s well worth the time and patience of practice… If you’re already used to two-wheel bicycles then it will feel natural. 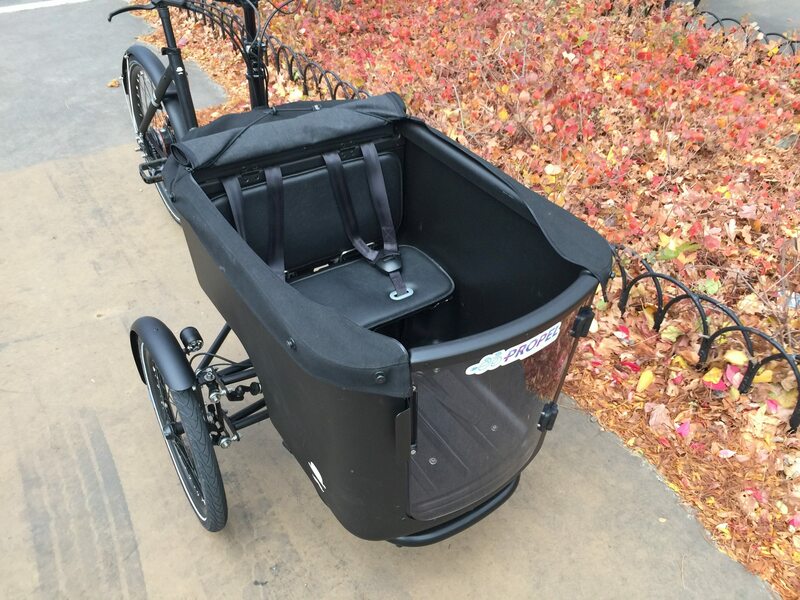 Many of my other trike reviews talk about stability and accessibility for people with limited balance and that is not what this trike excels at. It’s slightly more stable than a bicycle but less familiar and thus, on par in my opinion. I love the way it loads, am a huge fan of the accessories and appreciate the color options. The telescoping stem and standard adjustable seat post allow it to fit a wide range of riders, tall and short alike, and that’s great because you might need to share it in order to justify the high price tag. Yes, the Bosch drive system will last you and yes the frame is going to be solid. Perhaps you need to replace the battery someday and yes I’m confident that they will still be available. 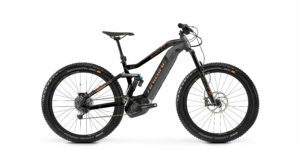 This is an ebike that will last and perform in ways that make it a valid car replacement. The Butchers and Bicycles website has a list of dealers in a number of countries and while only a handful are in the US so far, it’s a great bike to see in person if you get the chance. Sometimes I wonder if innovation has always a shroud! When you want more hp find a street race/mechanic ! When you want a ebike you have to get a new frame! Why? I have this bicycle/trike as a second car for the household. It has grocery duties. An advantage of the tilt, is experienced when riding on roads with a huge camber angle. On a standard 2-wheeler, this is not noticed as much. But on a standard trike, the rider and cargo contents may be slanted towards the edge of the road. On the MK1-E, the rider can compensate somewhat, still be upright, and keep the cargo horizontal. Other various advantages are that I am less wary about riding in a door zone even if I avoid it out of habit. The chances of coming off the bicycle in the rain is lower—which would be good if I were to carry a human in front. It is still possible to tip the bicycle. It is a fairly long bicycle, so is not compatible with some bicycle “infrastructure” e.g. islands when crossing busy roads. It sometimes cannot maneuver through sharp turnings e.g. at bicycle crossings. I have a frame-mounted rear wheel lock, which should be a standard purchase for this particular machine. This lets me park on the pavement, sometimes not close to a bicycle rack. I doubt I could reliably get close to a rack to use a u-lock; whilst not blocking other bicycles. I had the same cover you had in the video. In practice, while it was on, I didn’t use the bungee cords and the cup holders much as they were inaccessible. Overall, I am very happy with this machine. Mid-drive in particular puts my mind at easy. The other bicycle I considered was the Riese Muller Load. Hi. 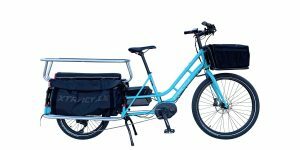 I’ve watched a couple more of your reviews on electric cargo bicycles. They are so good. Here are a couple more points about the MK1E. I live in a place with marginal bicycle infrastructure. We’re in a peripheral city, so there’s only that much money and vision for that. Curbs/kerbs. At the local markets, there’s a spot where I can put the trike out of the way. But I have to mount a curb to get there. No ramp. On a standard bicycle, this is no problem: just ride or walk the bicycle, roll it up the curb and that’s that. On this trike, I get to the curb, turn the trike around (see next point), and then drag it backwards by the seatpost to mount the curb. Then park the trike. I can usually come down off the curb going forward, but have done it going backwards as well, when carrying eggs, or on a fully loaded trike. This also means that on a standard bicycle I can cross a median in the middle of a road fairly easily (if I can stand on the median with the bicycle). With the trike, it’s not an option (too heavy, too big); I have to find a different route. Changing direction. Sometimes when the trike is stopped, I just want it to point in a different direction. e.g. when I’m done shopping, or when I want to reverse the trike into a parking spot/garage. Again, on a standard bicycle, just lift and turn. Or do a 3-point turn if it’s fully loaded. On this trike, I lift the seat so that the rear wheel is off the ground. And then walk in a circle until the front is pointing where I want it to go. To be able to do this on a fully loaded cargo bicycle/tricycle, I think is pretty neat. If there’s something really top heavy (human, potted plant etc) right in front of the cargo area ahead of the front wheels, then be cautious, or avoid. Because the trike could just tip forward. Bottle holder. There are bosses for bottle holders which I haven’t used yet. But there’s also a bottle holder in front. Since I posted my last comment, I’ve started to use it regularly. I carry a Logitech UE Boom speaker, and play music (not spoken word e.g podcasts because I don’t have it that loud) from it (bluetooth from phone). I find it helps to listen to something aside from car noise, or the Bosch motor whine. I find it less hassle to get started/stopped, and safer than using wireless headphones. Service. 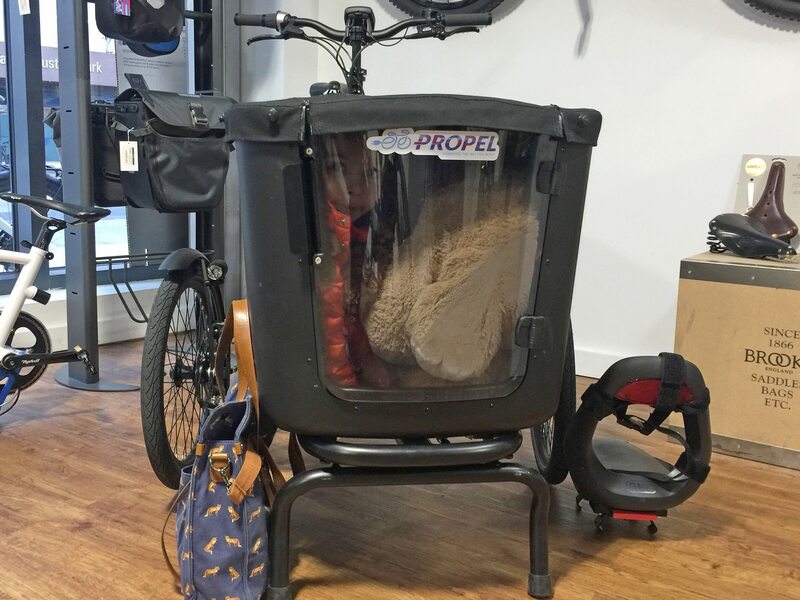 I have a good local bicycle shop where I bought the trike from, that did my almost-one year service with. I think I really need this support. During this time I haven’t tried to remove the wheels yet e.g. to repair a flat. It’d be complicated by the belt drive in the rear, and the front arrangement. So I better make time to learn. The front ride is fairly bumpy when empty. I wouldn’t e.g. put a notebook computer on the cargo floor. I usually put eggs in a bag on the front seat and tether them to the steering riser to prevent them falling off. I’d carry a notebook computer in a backpack, or in a pannier on a rear rack. The front door is a weak spot if boxes lean on it. The latch is not fully secure (at all). And the raised seat area means that boxes will tend to tilt towards the door. If I carry a big box, I lean it as flat as possible so that it engages both the front corners, and doesn’t contact the door. e.g. when I carry a Brompton bicycle box, it ends up diagonally in the cargo area. 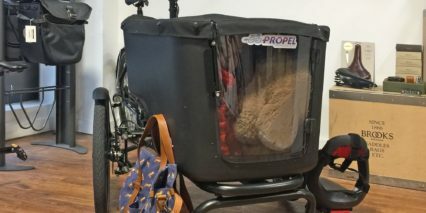 I think in a different cargo bicycle, I’d be able to carry much more big boxy stuff (as opposed to groceries), just because the seat part is not necessarily in the way. The battery is nestled between 2 metal partitions. 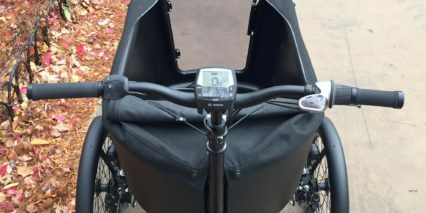 The best way I’ve found for me to charge the battery is to be flat on the ground (like doing a push up or plank) on the right side of the trike, and try to insert the charging cable into the slot. Opening the lid, and removing the battery routinely is just way too much work for me. This was still the right purchase for me. It’s expensive, but as long as it helps me not buy a 2nd car for as long as possible, it’s worth it. With regards to the cons: The Mk1-E with SRAM GX 1×11 drivetrain that I got delivered directly from B & B a couple of weeks ago has a bell mounted and a BBB neopren protector on the chainstay. Don’t really see a need for a chainstay protector if you’ve got beltdrive. There actually is a need for some sort of chain guard with the belt. In fact, it’s even more necessary. 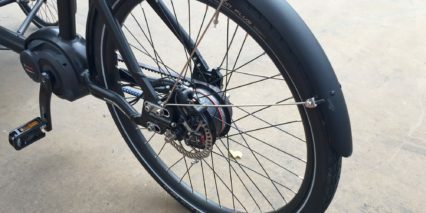 If you are riding at a good cadence and your pant goes into the belt, it will flip the belt off the sprocket, and then you need to loosen the entire rear end (6 bolts, I believe) in order to put it back on. Ask me how I know. I carry a full set of tools with me just in case. If I had the chain, it’s easy to just put it back on. I gave this a test ride yesterday finally after having my eye on it for a couple of months. First trip out was by myself to get the hang of how it rides. I found it a bit unnerving at first but got used to it fairly quickly. Starting from a stop, uphill, while needing to make a right turn into a bike lane was quite a challenge but something I suspect would get easier as I became more familiar with it. As a lightweight rider (120lbs) I found that I had to lean fairly forcefully at times, which was weird and sometimes frustrating. I suspect it would be less of an issue for riders larger than myself and become less noticeable over time. The next time out I had both kids (18 months and almost 4 years) in the box. There are some mild annoyances in this area. First, the buckles (at least on the one I rode) are “puzzle” buckles, meaning that you have to attach both pieces to each other, then insert them into the buckle. With wiggly kids this style of buckle is annoying and there’s a reason that very few car seats use it anymore. Furthermore, as far as I could determine, the length adjustment for the straps is not easy to access. Not a big issue if you always have the same kids riding, but annoying when you take a friend’s kid somewhere or are trying to test ride a bike. Finally, the bucket is so deep that my son’s head was right at the level of the edge of the bucket. This meant his helmet was banging against the edge of the bucket on every bump and he couldn’t see much. Overall though, the bucket left a lot of space for the kids and extra cargo if I’d wanted to put it in there, there was a lot of room over their heads with the rain cover on, and they did not complain about bumps during the ride even though I felt like they were getting bumped around kind of a lot. Of all the bikes at the store this is my 18 month old’s favorite because the door means it is the only one he can get into by himself. I loved being able to open up the back of the rain cover to make talking to them easier. 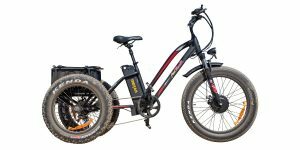 For hill climbing, especially loaded, I was impressed for a trike but found it lacking compared to the Riese and Muller e-cargo options that we’ve also been considering that have the same Bosch motor. I thoroughly enjoyed your comment Genevieve, thanks for sharing insights on how the child seat buckles might be improved. This is something I had not even considered, also the depth of the bucket. Thank you! I have this bike, and I love it. It is my main source of transportation, and I put about 2,000 miles a year on it. I use it to take my 5 year old to school and to bike to work. I load it up with tons of groceries. I take my dogs in it. I even have a flat bed trailer I use for going to the lumber yard. I have a rear rack on it and have Ortlieb panniers and can hold a ton of stuff. Overall, I love the bike. But there are a few issues that you may not notice on a short review ride. There really isn’t suspension on this bike. Your (terrific) review makes it sound like it does. The springs that you see are only to assist the bike righting itself through the corners. We have some pretty vicious potholes around our area and my son complains about the ride. It does actually ride much better with a good load in it. You have 3 wheels to worry about. On a 2 wheeler, if you see a pothole you steer around it. Most of the time if your front wheeler misses it your rear wheel will miss it as well. Not so with a trike. You now have to worry about both of the front 2 wheels. And if you forget about the back wheel and hit a pothole it will send a spike right up your spine. You have to pay attention. On a positive note, the 3 wheels make it more stable in the snow. The NuVinci system, while good, isn’t perfect. Yes, you can shift at a stop which is great. But if you are pedaling with the assist on you will have difficulty shifting without a brief stop of the pedals. It took me a while to figure this out. I think the Bosch motor puts a lot of torque on the hub, and if you don’t pause your cadence, you will have a tough time shifting. It will require quite a lot of hand strength. This is a bit of annoyance as they sell it as a fluid shifting experience, but you really have to give a pause. I developed “trigger thumb” because of it. Once I figured out the pause I was able to heal the tendon in my hand. I would like to upgrade to the In-Sync system, but it requires me to send the motor back to Bosch, or sell this bike and buy a new one. The shifting cables (there are 2, it’s a push/pull system) on mine got water in them. This might not be an issue for most people, but if it is below freezing the shifter will freeze up. I keep the bike in a garage so it is around 50 degrees when we get in. Depending on the temperature outside it may freeze in a half mile. If it’s really cold it might be a few hundred feet. You have to find a happy middle gear before the freeze up. It is a real annoyance. I just replaced the cables and hope this will fix it. Again, for most people this will probably not be an issue. It is wide. Not horribly so, but with a 2 wheel cargo bike you can squeeze between a stopped car and the curb by having your tires a few inches from the curb with the box above the curb. You can’t do that with the trike. You do have good visibility of both wheels, so you know what you can get through, but there’s no way you can use extra finesse to slip through. Maybe this isn’t that important for everyone, but we live in a seacoast town that gets very backed up in the summer and it’s not much fun to be stuck in a traffic jam when you are used to being able to skirt around stopped traffic. There really should be some sort of chain guard on this. I think the designers liked the clean look of not having one, but if you get your pants caught in it, it will pop the belt off, and you have to undo the whole rear wheel assembly in order to get it back on (6 bolts). If you try to force the belt back on you will ruin it as it is carbon fiber (at least that’s what the manufacturer says). For a bike this expensive I really wish they had included a good tool set. After twice jumping the belt with my pants I put together a nice set and I keep it in the glove box. Again, I love the bike, and your review points out a lot of the great features. But I am actually considering moving to the Riese and Muller Load to get the suspension and the upgraded Hi-Sync system and motor. I think it would fix a lot of the above issues. The only problem I see is the loss of stability in the snow. Thanks for your great review. When are you going to review the Load? Hi Ned, you raised some excellent points about a three-wheeled experience that I hadn’t considered. It would be frustrating to hit potholes and be limited on navigating through traffic. I really appreciate you taking the time to share and agree that maybe a toolkit is a good thing for everyone. Your thoughts were very fair and I hope the bike either works great ongoing now that you’ve learned about the limitations or you find something that’s a better fit. I’ll be reviewing the Load soon… just had a business trip that has slowed me down for the past week. Sorry! Hey Ned, Are you still considering selling your MK1-E? I’m very interested! Hi Matthew, I am considering it. I’m in Portsmouth, NH. Where are you? Now that my son is riding his own bike I don’t need the amount of room up front. The only problem is getting a chance to demo the R+M Load or Packster involves a 5 hour trip to NYC, and then if I order a bike it takes 3 months to arrive. I just need to figure out the logistics. Let me know your thoughts. We are in Brevard, NC. But, we lived in Vershire, VT for four years and love it up your way. Can I email you directely? Hi Matthew, send me over an email to [email protected]. If not, just search on my name and you should be able to find me. Or put gmail.com on the end of nedsavoie and you will probably find me. Cheers! I also have this trike (Butchers & Bicycles??? Should be Butchers & Tricycles). I am riding it for about 6 weeks now and have around 400 miles on the clock. I live in Munich, Germany, which is a great city for cyclists. Almost all streets have bike lanes on each side and a lot of the side streets are designated bike streets, where bikes have priority over cars. One-way streets are accessible for bikes both ways. Overall the ideal ground to test bikes and trikes. This being said, you will see a huge amount of cargo and family bikes of all makes and shapes and price levels. 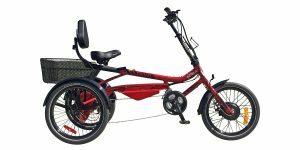 The most popular is the Nihola, which is a really stylish tadpole trike. There are 100s of them here. Also Bakfiets, Bullits, Riese & Müller and so on. 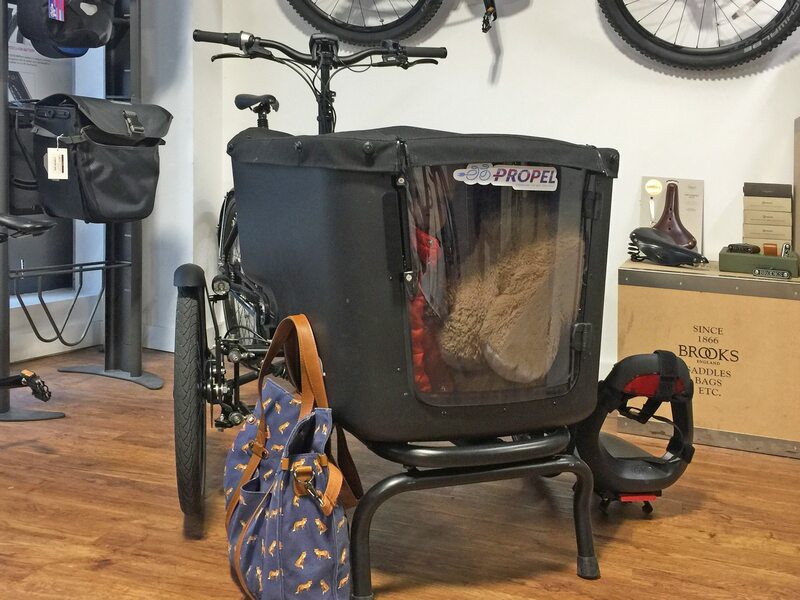 One of my mates actually imports cargo and family bikes and his shop is thriving, with sales increasing every year. I am lucky to be one of only 10 MK1-E (and non E) owners here in Munich and as a bike enthusiast and frame designer (as a hobby), I can tell some pros and cons. I definitely share CF’s opinion and experiences. However, I do not mind taking the battery out for charging. ;) What I can add is, I find the Nuvinci in its current form insufficient. H-Sync is a must, or as a bare minimum Harmony. Proper shifting is essential, especially with load. The Bosch Performance Line is a tad too weak for this huge device. I guess this is why the new 2017 models have the Performance CX with 70nm instead. Also, I could see the 2017 models have a lot of kinks worked out and are improved overall. I have ridden a lot of bikes and also had my share of cargo trikes. I must say, nothing was as exciting as the MK1-E. It gets me every single time and I am riding it daily. Now, this being said “It gets me every single time” is not always a good thing. The MK1-E behaves erratic and unpredictable at times, which causes me to ride way more focused on my actions and surroundings. I have to keep watching traffic, road conditions, turns and obstacles way more than I would on a normal bike. For example, the tilting mechanism is awesome, but it needs a few degree more at certain turns to be fully useful. I sometime have to slow down dramatically to be able to steer more than i can lean. 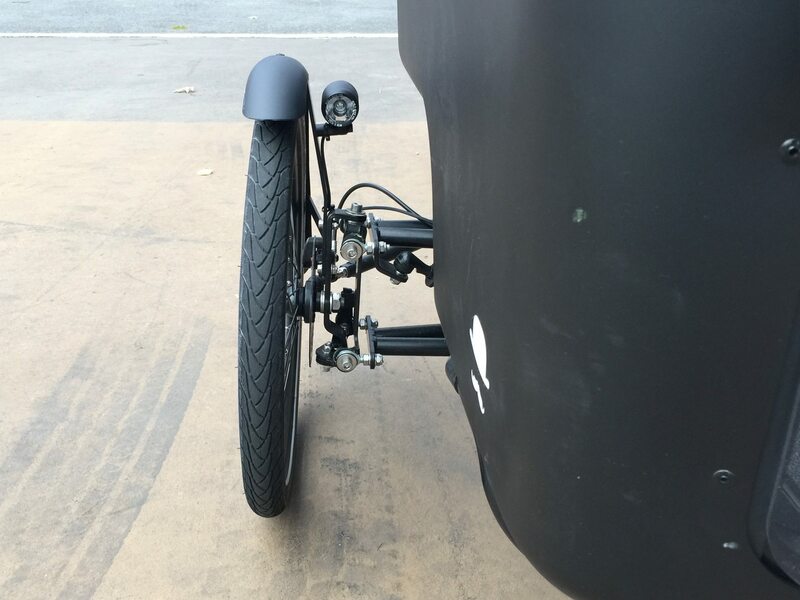 Another issue, the tilting is the highlight of the trike, but its also its biggest gripe. Both wheels are tilting on the same central axle, like a see-saw. This means that anything on the road effects both wheels simultaneously. If I hit a manhole cover, pot hole (gosh) or curb on one side, it automatically affects the other. This is most noticeable when turning over tram lines or uneven pavement/asphalt. The trike will immediately understeer on the front and drift a few inch away. Individual suspension would benefit this trike more than anything. One thing I can recommend is to get yourselves some Schwalbe DocBlue or Stans tube sealant. You really do not want a puncture on a trike like this. Especially on the rear. After 400 miles, while cleaning the trike, I noticed that BOTH!!! lock nuts on the rear wheel where loose. Again, completely loose. This prompted me to check all screws, nuts and bolts on the trike and behold, a good half of them were loose and I was able to turn them by hand. I do some an issue with the rear wheel not sitting centered. Looking at the ABUS frame lock I can see that the tire distance to the lock is about 5mm, while on the right its at least 11mm. Looking at the tire running along the mud guard, it is not sitting straight, but seems bent in some why. Could be that the wheel is not dished correctly. 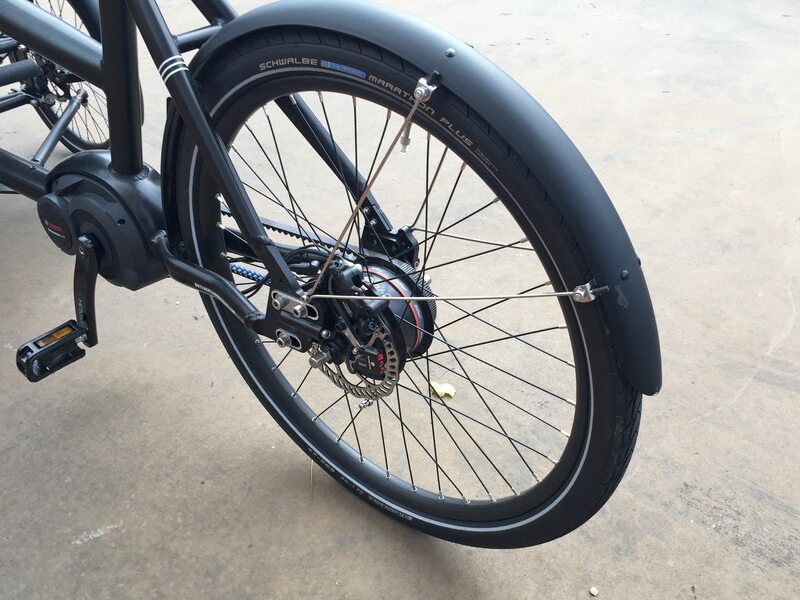 Also, the 2 front mud guards are mounted with 1 screw only and it seems the top screw is missing on both sides. Really bad are the steering limiters. These are rubber stoppers mounted on small steel pikes, which are part of the tilting/steering construction. They simply have the purpose to limit steering angles. Due to the metal pike being some weird sharp trapezoid shape, the left rubber had sheared through and I had to improvise to repair this. If those pike where properly round this would not have happened. I also worry about the rubber stoppers mounted on the kick stand. They will wear off and probably sooner than I want. Butchers & Bicycles told me that I can order new ones through my dealer, as they are order made and surely, I was not able to find this size anywhere. For the price, some of the components used are really the bare minimum. The bell was a joke and I replaced it with a Spurcycle. (I wanna install a fog horn) The Bosch Intuvia was not really good, so I replaced it with a Nyon. I will also replace the Nuvinci with either HHi8 or H-Sync. The lights in the front are ok, but the rear is a bit small and because its mounted on the left, there is somewhat of a dead zone, when looking from the rear-right. The rims on all 3 wheels are not really good. The joints are the worst I have ever seen on any rims. I am now trying to find alternatives for these. Perhaps something carbon. After so much ranting, I wanna stress that I do love this trike. I mean from all the tadpoles I have ever ridden, this is the best. I do have the 2016 model and wish I would have waited for the 2017, but too late now. I am still a happy camper and will work on getting the current kinks worked out. My local bike shop (Velocompany.de) is awesome and they do know their stuff. Wow, thanks for the detailed writeup Tokyoskies, I enjoyed hearing about your upgrades like the Nyon and thoughts on 2016 vs. 2017. 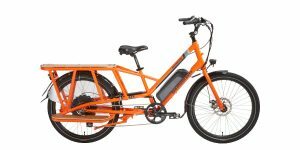 In the US, we have a Bosch CX motor with 75 Nm and I agree that for such a heavy and large ebike this makes sense. I hope it continues working for you, or at least making you happy in the mean time as you repair and customize it. Maybe Loctite glue will help the nuts to stay more secure? 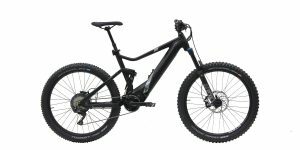 It sounds like you use the bike a lot, feel free to share any more thoughts down the line, I think it really helps people who are considering the same product or looking for help on a fix. No worries, I love to share. Cannot believe I typed all this on my phone. Loctite 243 is the one I would recommend. The bikeshop guys were pretty shocked about the lose nuts. Then again, **** happens. I will receive my new CX Motor in August for about 600 bucks. As you said, it’s a must have upgrade and since it’s the 2017 CX, I will be able to add a 2nd battery. This will give me some serious range, even in turbo. So, the next project for me is to add some Loopwheels to the front. I think this will be a good match for the MK1 and add some serious comfort for the kids (and my cargo). Problem is, those guys stopped making 20″ wheels and now focus on 26″ wheel chairs only. Alternatively I could imagine to change the wheels for some 20″ Bygen Carbon wheels. What do you think? Would be nice to have a Tesla Powerwall where the locking storage compartment is, run wires to a trailer hitch and pull a camper trailer, power it up when you can by ‘shore power’, have some solar on the roof of the camper trailer. With a chemical toilet and some air conditioning, could be livable long term. Thanks for a very helpful review and all the valuable comments! I have not seen a spec for “maximum weight inside carrier” and “maximum height of a passenger without hitting the inside of the hood”. Do you have this information? 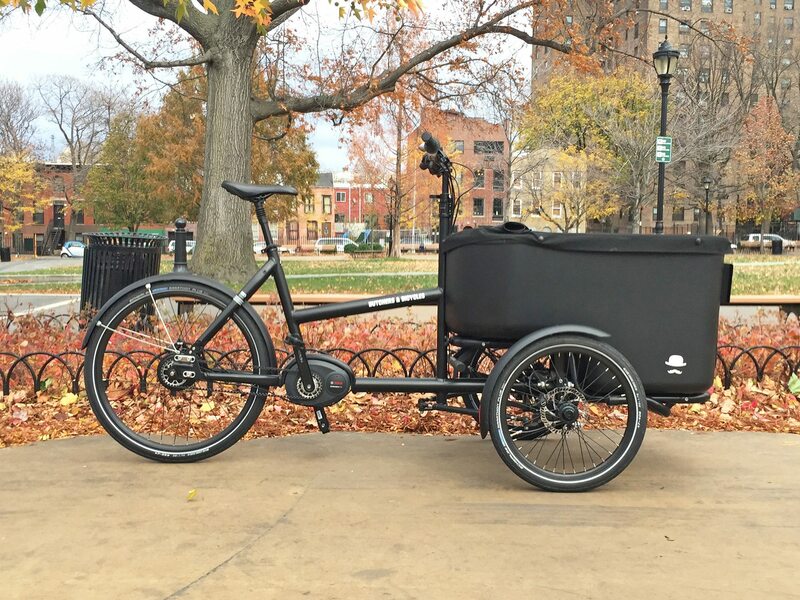 Today, we ride a TrioBike Mono which in my opinion is the best looking cargo bike around. More importantly, it is light weight and the company underlines safety as one of the key traits. We’ve ridden it for 5 years and it holds up as brand new. 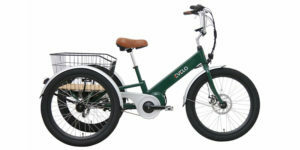 Doing research again as I will either convert it by adding the BionX motor or simply buy a new electric cargo bike. I find the MK1-E very interesting. Have any of you contrasted the Trio Bike Mono-E or Boxter-E models to MK1-E? Findings? Really interested in this as it would be a comparison between two really innovative makers. Thanks so much for the review, it was comprehensive and very useful indeed. Hi Avaril, I did experience some instability at low speed and when getting on the bike, it seemed to tip side to side… I haven’t ridden the MK1-E for quite some time so I cannot be as detailed in describing how it felt, but I do remember having to balance a bit and wondering if the steering was loose or if that was just a side affect of the tilting steering design. 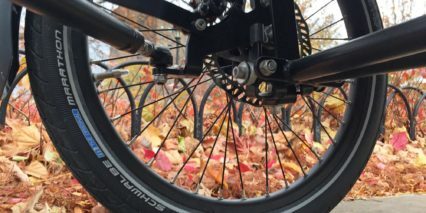 Pennsylvania law defines pedalcycles as weighing less than 100lbs. With this weighing over 100lbs, do you know what is involved with legally operating it? PA ebike law link here. Very interesting… I’m not a legal advisor and haven’t visited Pennsylvania, most states talk about power and speed limits vs. weight. 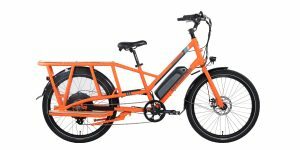 My own experience has been that if you’re riding carefully and are respectful with law enforcement, they are generally very accepting of ebikes. I have never once been pulled over or questioned. Butchers & Bicycles does sell a slightly smaller cargo ebike that might weigh less. I’m not sure anyone would actually pull you over and try to weigh your bike unless they were trying to charge you based on behavior. 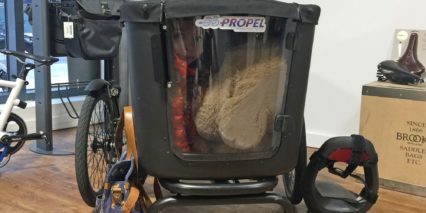 These things definitely look like bicycles, and if you are hauling kids or cargo, I suspect that most people would just smile at how unique it is vs. feeling a need to question or charge you. But again, I’m not a lawyer. You could always send a picture to your police department and ask. I carry around a special doctor’s note when I ride because I have a knee injury and ebikes reduce my pain. I’ve never had an opportunity to even show the note, nobody has ever asked or cared that I was on an ebike. Court, it has been a couple of years since you posted this review. Since Propel Bikes seems to be one of the few dealers in the U.S., any chance you could do another review on the newer version of this bike and also discuss the ordering process?